During the mountain guides’ training seminar held on 21 October 2017, we tested and demonstrated various on via ferratas using different equipment. We used an 87-kg wooden block, and the tests were carried out at the Mojstrana Via Ferrata. The anchors were 2.5 meters apart, and the block was thrown from a height of approximately 1 meter above the upper anchor. The length of the falls was therefore approximately 4.5 meters. This is a reasonable fall length, which can be expected on modern via ferratas. The Mojstrana Via Ferrata is constructed according to the French system, which, compared with other systems, exhibits the lowest forces during a fall. The manner in which falls are held in various systems is illustrated in the images shown below. The first test was carried out using an accessory cord with a diameter of 6 mm. A single strand of cord was used, with a figure-of-eight knot tied at both ends. The cord was attached to the cable using a locking carabiner, and the wooden block was attached using a girth hitch (this attachment was used in all of the tests). As expected, the accessory cord broke. The second test was carried out using a sewn nylon sling (length = 120 cm). The nylon sling also broke during the fall. We used a single climbing rope for the third test. It held, but we were left to wonder what would happen to the climber in such a case. Last year, the forces which occur during such falls were measured in a lab and they are way too high for any healthy human body to handle. In theory, the maximum impact force shouldn’t exceed 6 kN, whereas it probably came close to 22 kN during the fall caught by a single climbing rope. 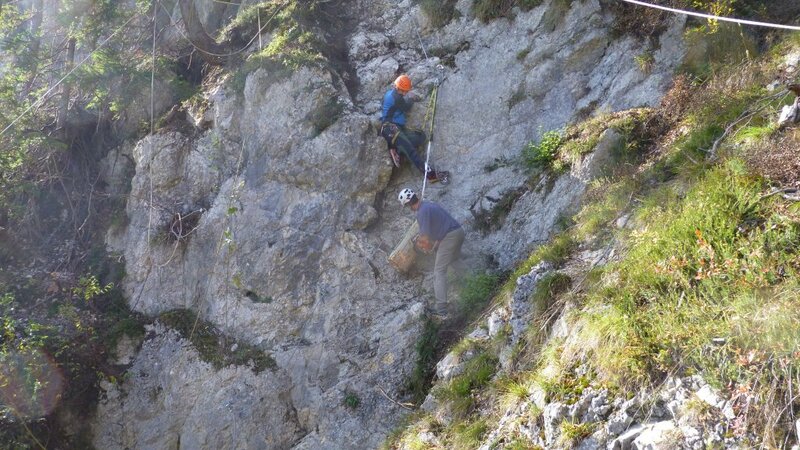 The fourth test was carried out using a Singing Rock Tofana II via ferrata set. It handled the test without any problems. Since the energy absorber hadn’t completely torn, we repeated the test. Even after the second fall, some of the sewn webbing energy absorber still remained intact. This means that the via ferrata set successfully held two falls. But you should bear in mind that a via ferrata set becomes unsafe at the slightest tearing of the energy absorber and should be replaced immediately. Still, our tests have shown that a climber would still be able to safely reach the top of the via ferrata using a via ferrata set with a torn energy absorber. The equipment for these types of activities is constantly being revised and improved and all new via ferrata sets come with recommended user weights. If you weigh less than 50 kg or more than 80 kg, you should make sure that the set is still safe to use, as it might not properly absorb the impact force. Our final test was carried out using Singing Rock’s Phario Palm, which is this company’s most advanced model. It can be used by users weighing from 40 kg to 120 kg. We decreased the weight of the wooden block to 40 kg and the energy absorber still did its job and started to tear, dissipating the energy and dramatically decreasing the impact force of the fall, which should never exceed 6 kN. The energy absorber won’t function properly if you are too light and it doesn’t start to tear (considerably increasing the impact force), or if you are too heavy and it tears completely before the energy is properly dissipated (again resulting in a considerably higher impact force). You can watch all of these tests in a short video we’ve filmed on location. – Recommendations of the Alpine Association of Slovenia, based on the German Klettersteigbau Empfehlungen. – Krznar, B.: Analysis of various rope systems on via ferrata, 2016 (EngD thesis).